Latasha always cooks with love, passion and a generous heart. This is why Latasha’s Kitchen products are uncompromisingly good. Latasha was born and brought up in Malaysia. Her father, as well as mother’s family, originally hailed from Kerala in Southern India. As a result, her cooking reflects the distinctive traditions of food from both South Asia and Southeast Asia. Latasha’s Malaysian-born husband is of Malaysian and Sri Lankan descent – the later also a land noted for its coconut and chilli-based curry dishes. Settling in Perth in 1994, Latasha quickly realised that Australians were unfamiliar with the many ingredients, methods and styles she took for granted growing up in a different culture. For years she harboured dreams of demonstrating her love of food through her own cafe, something that was brought to fruition in 2003. Resisting the temptation to tailor her original family recipes to suit ‘western’ palates, Latasha began converting a growing number of customers to appreciate the flavour of meat slow cooked on the bone using masala ground from scratch, with fresh ingredients and strictly no preservatives, commercial stocks or MSG. I’m never happier than when I am in the kitchen creating beautiful food. After 10 years of operating her highly successful and popular cafe, Latasha decided it was time to produce a specialist range of home-style pastes, condiments, relishes and dressings that people could buy and use every day at home. Latasha’s Kitchen followed a natural progression for both her and her customers. A new journey unfolded. I wanted my customers to be able to make and share good food with family and friends in their own homes. The only way I could make this happen at a large scale was to close my restaurant and produce a range of pastes, condiments, relishes and dressings for them to use at home. This way they could replicate our restaurant meals in the comfort of their own homes and share it with friends and family any day of the week. I want my customers to create their own food memories! The range of products released is really versatile and were influenced South-East Asia, North India, Regional India and Australia. I am driven by passionate love of flavours, textures and colours. I also love to inspire others to experiment, create and explore too – especially when the seasons change. I created my products to help simplify the creation of base flavours to enable anyone – whatever their age or cooking ability – to create delicious food for themselves or others. I never stop learning and experimenting. I live for it! 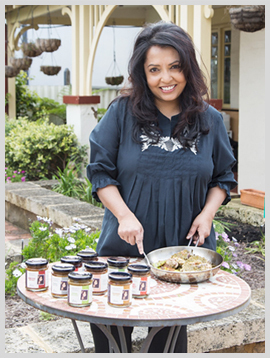 Our products are certified Australian-made and crafted, using only the best local fresh ingredients and imported top-quality dried herbs and spices by Latasha in her commercial kitchen. Latasha’s Kitchen is still 100% owned and operated solely by Latasha Menon. Most products are also naturally suitable for vegetarians, pescatarians, vegans and coeliacs. They are also free of fillers, artificial preservatives, bulking agents, citric acid, colours and MSG. Every product is certified gluten and wheat-free and endorsed by Coeliac Australia.